The Meaning of "plow head, plow bolt"
"plow" is from "ploh", spoken by people in England during 1100-1550 A.D.
which is from "plog", spoken by people in England during 450-1100 A.D.
which is from "plogr", spoken by people in North England about 800 A.D.
"bolt" is from "bolt" (arrow), spoken by people in England during 450-1100 A.D. 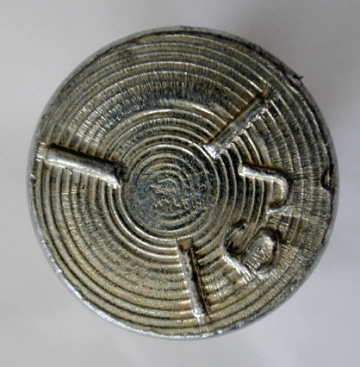 Type of head for a screw or bolt that holds screw or bolt to a surface without adding much above the surface. Surface can remain fairly smooth. Added during manufacture. Details of design can be changed and can be different sizes. 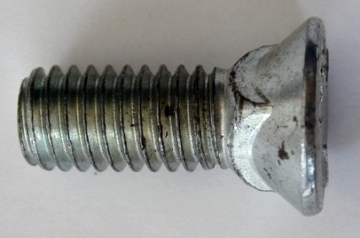 Plow bolts: a bolt with a countersunk, flat head and square neck.